Nov. 8, 2017 8:30 p.m.
Local skateboarders are mobilizing to push for a new skatepark in Victoria. Vic West Park, built in 1992, was upgraded this summer to the excitement of local skateboarders, but that doesn’t negate the need for additional parks in other parts of the city, says a local skateboarding group. The Crystal Pool area and Topaz Park are being eyed as potential sites for another “all wheels” park in the city. Coun. 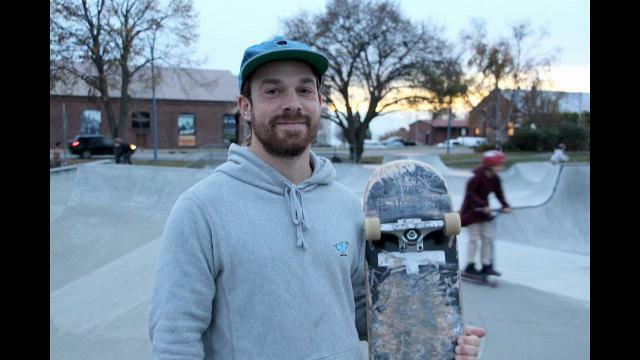 Jeremy Loveday is on board with the skateboarders’ pitch for a second location. He forwarded a motion last month asking city staff to report on the implications of including a new skatepark in the 2018 budget. He said he’s been working with residents, youth, skateboarders and advocates to find another location in the eastern part of the city for young people to practice the sport safely. Loveday added that youth are currently skateboarding and riding scooters on the street in Quadra Village on Kings Road, which can often be unsafe. Building a second location at Topaz Park would give them a place to play off the streets. He thinks young people enjoy the sport because of the adrenaline and the endorphins, but there are other reasons it can be rewarding. Wynn Campbell was at the park Tuesday evening watching her nine-year-old son ride his scooter. She said going to the skatepark is a good opportunity for him to learn from other kids, and he enjoys the challenge. A skatepark in Topaz Park would be closer to where she lives and more convenient. The region currently has four skateparks, one each in Victoria, Esquimalt, Oak Bay and Gordon Head.